Leicester Tigers head coach Richard Cockerill has defended his squad after they ended the season trophy-less despite having been in contention for the Aviva Premiership and Heineken Cup crowns. Despite finishing the season top of the Aviva Premiership table and powering into the final with victory over Heineken Cup finalists Northampton in the semi-final, the Tigers were beaten by a spirited Saracens side in the final at Twickenham on Saturday. 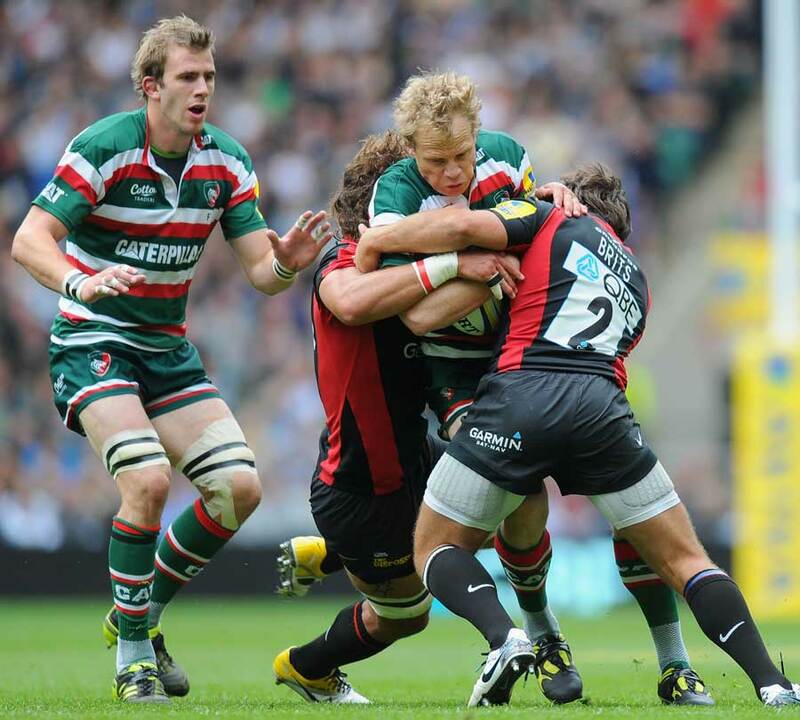 Leicester, who finished the season on top of the try-scoring charts, failed to find a way through the Sarries defence as they fell to a 22-18 defeat. It followed on from a disappointing Heineken Cup quarter-final exit to Leinster in Dublin, when England half-backs Ben Youngs and Toby Flood came in for much criticism. But the Tigers head coach insisted that he was proud of his players' efforts this season. "It is massively disappointing to lose in the final and we did not play as well as we would have liked, but there have been positives for us during the year," said Cockerill. "I've got nothing but praise for our players. "It is not a disastrous season. We lost to Leinster by seven points in the Heineken Cup and they went on and won it, and we've lost by four points in the Aviva Premiership Final. We are talking about small margins. "We've been consistent through the year, we finished top of the table, we've played in a seventh final in a row. We've had big injury problems with some important players and we have done a pretty good job working through them with young lads coming through." Cockerill believes that the exposure to Premiership rugby for a number of young players will put the Tigers in a strong position for the start of the new season when they are set to be without a host of senior players for the World Cup, including England's Flood and Youngs. "Those youngs lads will all be better for the experience," he said. "Guys like Manu Tuilagi, Steve Mafi, Ed Slater, they are all new to this level of rugby and they have all played their part in the season. The circumstances with injuries to senior players meant they have played more games than they probably expected, but they will all learn from that and come back wiser and better for it. "With a World Cup in the autumn, we've got some different issues for the start of next season, but the club is in good shape and there are plenty of positives. We will be critical of ourselves but we have got to get on with it." Saracens winger James Short scored the only try of the final at Twickenham to help them into a 16-9 half-time lead. But Cockerill said that the players were confident of turning around the game in the second period. "At half-time we just talked about being patient, though we were disappointed to concede the try," he said. "We said opportunities would come and we would get chances to put them under pressure at the set-piece. "We didn't have much ball in the first half but we got ourselves back into the game and in the 86th, 87th minute we were still in there with a chance of winning the game. Everyone has worked very hard all year, huge credit to the players and the staff for that, but sometimes you have to accept that you have lost. "It is obviously very disappointing to lose in the final but congratulations to Saracens, they played well. They are champions, they are able to enjoy that, and we will regroup and start again for the new season in September."